As London’s leading engagement rings by appointment supplier, we avoid the overheads of high-street jewellers and pass these savings onto our customers. During a consultation with us, we will take you through your options for a diamond or gemstone engagement rings and we will educate you about the characteristics of diamonds and precious metals we use for our engagement and eternity rings. 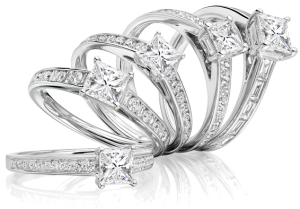 We specialise in providing engagement rings, with a large selection of styles. In addition, our skilled craftsmen can produce a custom ring to your specification. 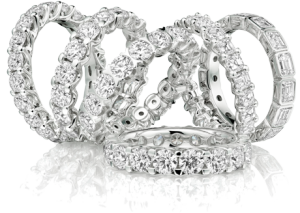 We also supply wedding rings and eternity rings in a variety of metals. We can provide a wedding ring to match an engagement ring or custom make a bespoke style. We have spent many years building our reputation as the diamond and gemstone jewellery company that you can trust. Situated in the heart of Hatton Garden, Voltaire Diamonds welcomes countless couples to our offices where we work on making their dreams come true. Our craftmanship and materials are of the highest quality, and we have a vast range of diamonds and coloured gemstones available for your special piece of jewellery. We offer a core range of magnificent rings, ranging from timeless classics to more contemporary designs. We have a wide selection of rings available immediately. Voltaire Diamonds also offers a bespoke service. We are happy to modify an existing style to suit your preferences and can offer computer aided renderings if you have design ideas of your own. In general, our rings can be made from £1,500. Price will then vary depending on size of stones, specifications, metal etc. In addition to our engagement and wedding ring ranges, we also now offer a growing catalogue of earrings, bracelets, pendants, and other bespoke jewellery. Perhaps you would like to purchase something special for an anniversary or special occasion or surprise a loved one with something they will treasure forever?